First Listen: Wye Oak, 'Shriek' The band, known for its glorious guitar noise, opts for a synthesizer-driven sound. Wye Oak's new album, Shriek, comes out April 29. At some point, even babies who bask in the warmth of attachment parenting need to learn to self-soothe — to regulate their emotions without their parents' guidance or even a hug. Often they do it with a thing: a blankie, a binky, a stuffie. Adults are expected to be free of such fixations, but the truth is, inanimate enablers still fill our lives. Musicians bring them right onstage. Why do you think guitarists name their stringed companions? Electricity makes these toys speak. But what if your serious toy, your amanuensis, stopped listening and responding? 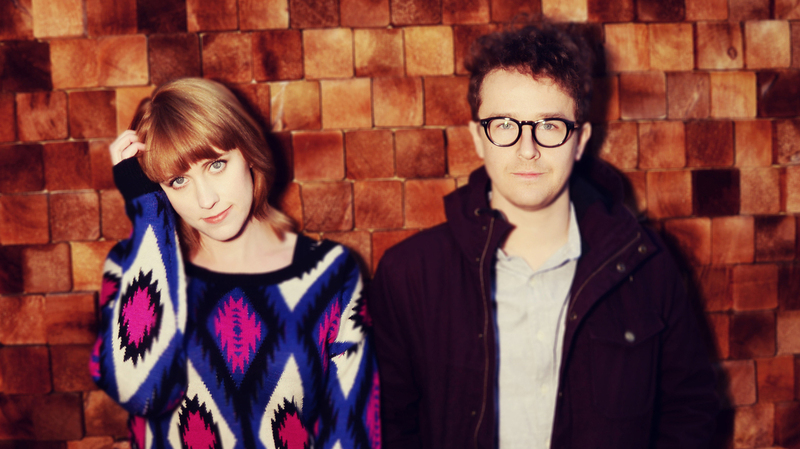 Wye Oak's new album Shriek was inspired by such a crisis. Exhausted after a punishingly long tour to support the duo's breakthrough album Civilian, Jenn Wasner returned to Baltimore feeling depressed and unable to write. Her trusty Reverend Jetstream only seemed to mock her. Wasner finally found solace and new inspiration in other instruments, especially the bass. Her bandmate, Andy Stack, mostly a drummer in the past, put his talismans partially aside in favor of synthesizers. Then, physically separated by the miles between Stack's Texas home and Wasner's on the East Coast, but connected by the technology their analog synths anticipated, they wrote a bunch of songs that explore existential uncertainty, yet sound like comfort. Comfort might be too solid a word. It conjures images of pillows, and Shriek's songs are more like thick atmospheres made for floating and falling, cloud covers built of shifting emotions. They could be called synth-pop, but their meanings unfold in slower-moving, subtler gradations than that label implies. The album's contemplative tone recalls New Wave sophisticates like Japan or Talk Talk — groups who made music for dreaming more than dancing. The insular spaciousness of '90s R&B savants like Aaliyah and TLC also make a mark. But the story is Wasner's, a struggle she has described as an "intense journey" that "happened in the confines of my own skull." Wasner's lyrics often mention the sleep cycle, and describe elusive, cruel objects of fear and desire who could be real lovers, but seem more like aspects of her own confused psyche. Her lyrics tend toward poeticism, with images that could at times be apocalyptic. "Even as I stand, is the ever after," she sings in "Paradise." "See it as it lands, fire over water." That's pretty Biblical, but Wasner's gentle alto, made stronger by voice training, persuades the listener to stay with her. "I fear no information," she sings over Stack's birdsong dreams in the title track. "I'm following how it seems in present dreams." Her willingness to gaze inward encourages the same in others. The contained but deep lushness of Shriek makes the album itself an ideal tool for calming the old thought machine. The album itself could become your talisman, treasured and well-used after many repeated listenings. The process of making this music, Wasner implies in the mystical, impeccably modulated "Before," made her "brand new." Getting lost in this music could have a similarly healing effect on others.